With the worst of the summer heat behind us, the days have become much more pleasant indeed. 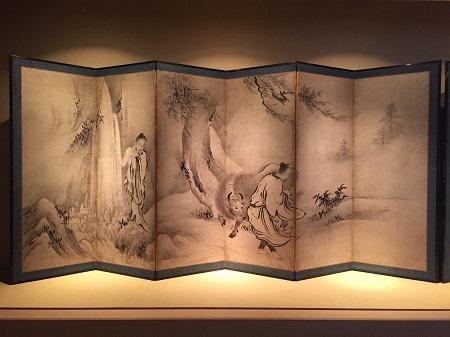 We are pleased to announce the latest exhibition in Shirokane, which includes a pair of Kano school folding screens once owned by Hara Sankei (1868 - 1939). The right screen depicts the legendary Taoist immortal Wang Tai Sin, who has the ability to heal. Impoverished, he became a shepherd in his youth, and after 40 years of practicing Taoism was said to be able to turn rocks into sheep, as shown in the screen here. 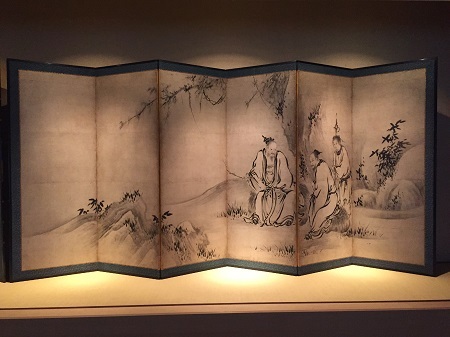 The left screen shows Xuyou and Chaofu, two legendary Chinese hermits who are often painted together. The story has it that Xuyou heard of Emperor Yao's plan to relinquish the throne to him, and after firmly rejecting the notion felt obliged to rinse his defiled ears in the Ying River at only hearing the idea. Chaofu, considering the water now unfit to drink, refused to let his ox drink there and returned home. The gaze of the ox here as he is thirstily turned away from the river leaves quite an impression.